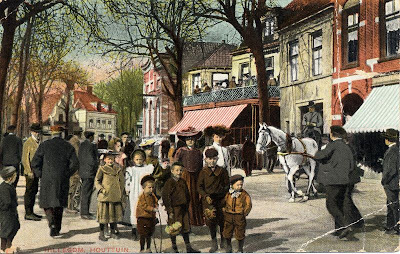 A postcard from the town Hillegom, sent on 30 July 1908. Houttuin is a small street in the center of Hillegom. There is a lot to see in this coloured photo postcard: The children posing for the camera, the ladies' hats, the boy with a hoop, clothes from a century ago. Note also the traffic: No cars, just a man on a horse and pedestrians. In the background (to the left of the horse) you can just make out a parked bicycle. I love the colour on this postcard, Henk. I'm not sure how to describe it but the sky in particular is done in shades we just don't find on Canadian postcards. I'm not sure whether it reflects a different lighting in real life, or a different aesthetic.